Dudley’s proves bigger isn’t always better. No one likes throwing away leftovers. You go to a restaurant, have a few drinks, enjoy your dinner, and often go home with a container full of uneaten food. Shrimp-fried rice in a small cardboard box. A soggy, half-eaten cheeseburger and fries in a Styrofoam package. Or a paper bag filled with the cold, wet remains of a once delicious turkey sub. All of them start their leftover lives in your refrigerator. They are brought home with the best of intentions. “I’ll eat this later,” you say to yourself, “I paid for it.” But all too often, those leftovers live untouched in your fridge, before meeting their demise at the bottom of your trash can. Many restaurants simply give you too much food. 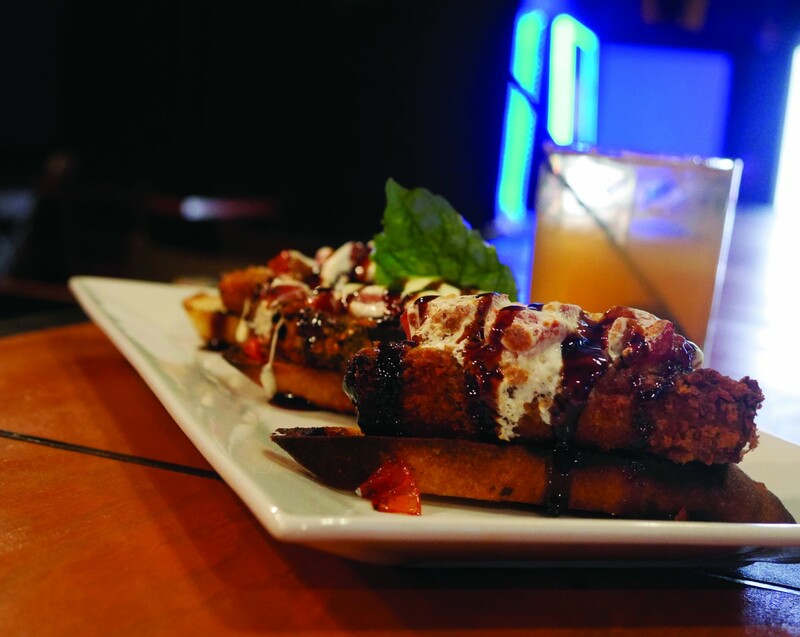 Dudley’s Restaurant and Bar, one of Lowell’s newest nosh spots, takes a different, less wasteful approach to downtown’s increasingly vibrant food scene. 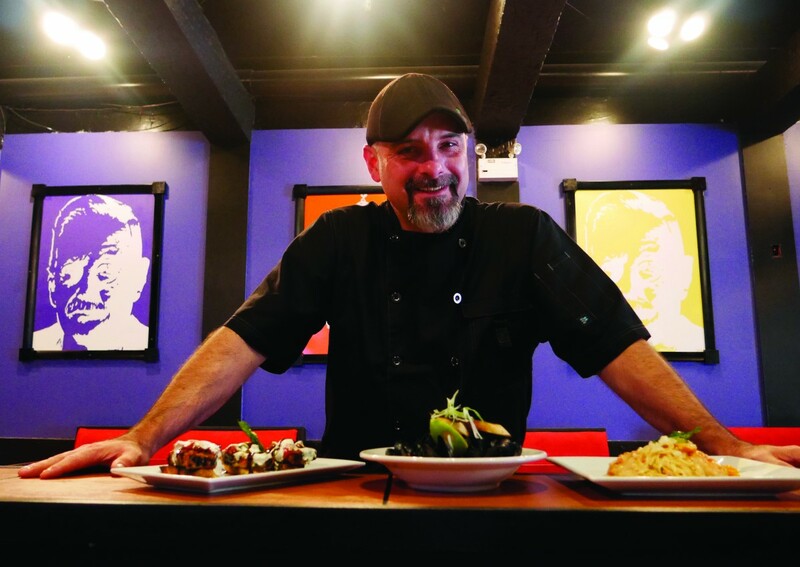 Jay Downs is the creative mind behind Dudley’s signature dishes. 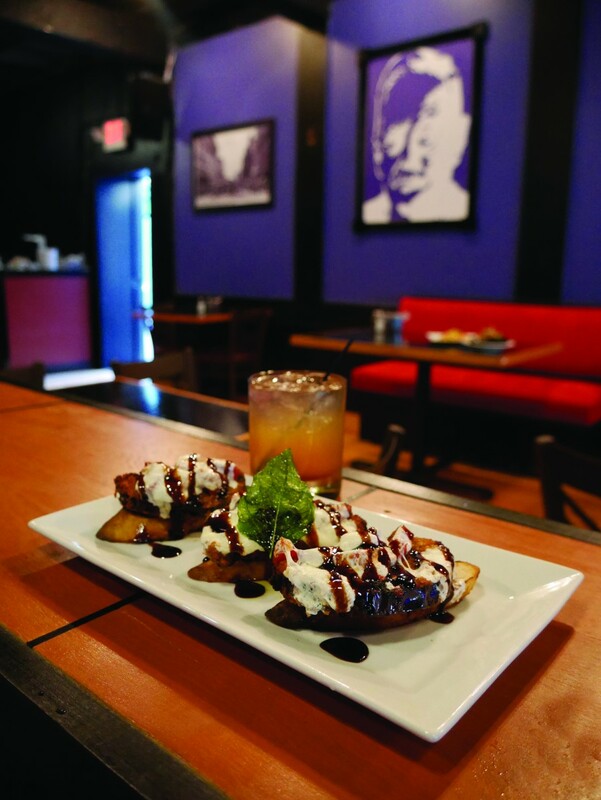 Dudley’s menu brings the small plate concept to Lowell. The portions are smaller, but so are the prices. Smaller plates and lower prices allow customers to sample multiple items on the menu, without burning holes in their wallets, or over bloating their stomachs. Downs, McCarthy, and fellow co-owner Matthew Murphy opened Dudley’s this summer. After leaving positions at Ward Eight in Lowell, they began scouting locations for a new restaurant of their own. They decided on the recently shuttered Hookslide Kelley’s building on Merrimack Street, and Dudley’s found its home. Food good enough to share with friends, or not. The crew floated around a few different ideas for the name of their new restaurant. Ultimately, they settled on naming it after a Lowell folk hero: Dudley L. Page. Known locally as “Uncle Dudley,” Page was a veteran of the Civil War who, upon returning home, founded the D.L. Page Company in 1866. For 75 years, the company was known for quality candy products, a restaurant serving up home-style cooking, and Page’s philanthropy. Page’s Clock located on Merrimack Street (across from the new Dudley’s) was named after him. You can read more on Dudley Page’s story on the restaurant’s menu. Once the pub’s name was established, the partners started renovating the property. The front bar was refinished in a glossy veneer with lights installed above , adding a warm glow to the main room. Colorful pop art portraits of the restaurant’s namesake hang in the dining area. 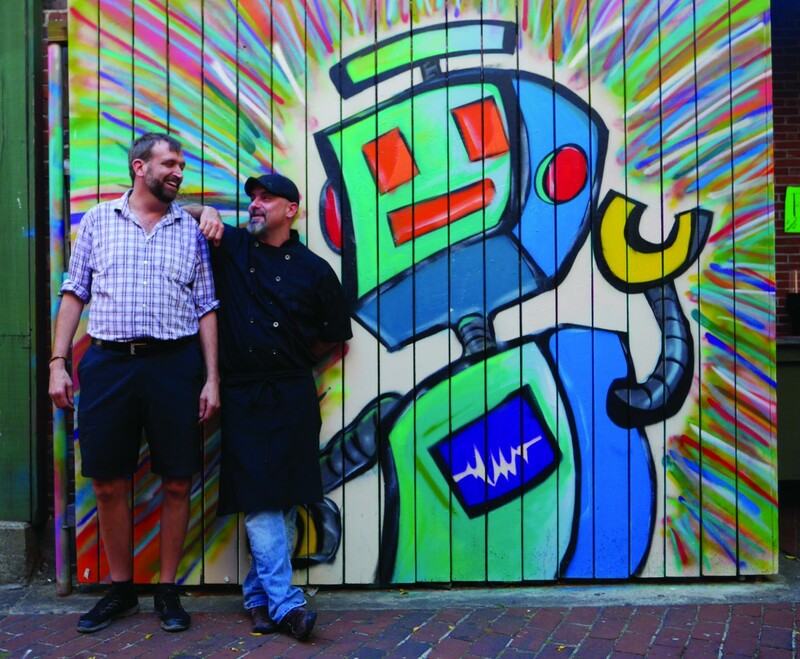 Custom artwork was also added to the patio area outside the bar, featuring a rainbow graffiti robot designed by Disko Paint & Art. Matthew McCarthy and Jason Downs. Dudley’s also features an element unique to the downtown scene: two separate bars, with two separate feels. Downs, a Lowell native, received his culinary education from the Cambridge School of Culinary Arts. He left the city in 1991, and then spent years working at some of the best restaurants across the country. But eventually, he found himself back home in Lowell, armed with years of experience and the desire to create something new. Dudley’s small plates menu changes with the seasons. 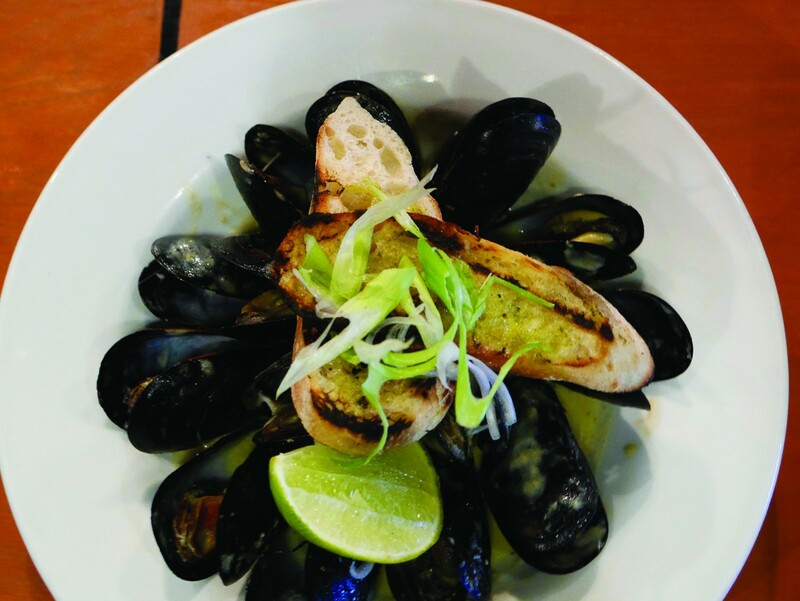 Speaking of food, Dudley’s offers a full menu of new American style, small-plate cuisine. Duck confit poutine, a steak sandwich with Cheddar ale sauce, buttermilk-battered chicken nuggets, buffalo mac ‘n cheese, flash-fried calamari, and flatbread pizzas are just a sampling of menu options. The popular weekend brunch featuring live music includes savory selections such as grilled salmon benedict, homemade corned beef hash and eggs, hearty breakfast sandwiches, Bloody Marys and mimosas. 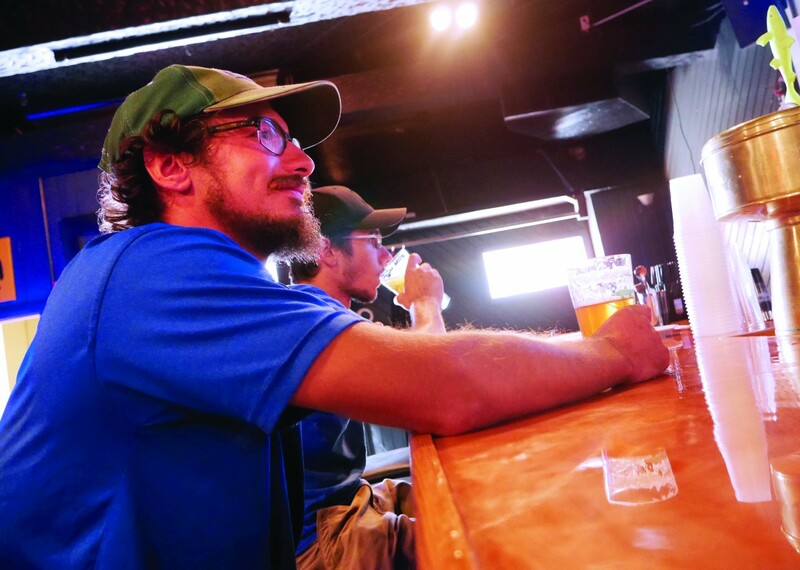 Behind the bar, Dudley’s also boasts more than a dozen rotating taps dedicated to high-end craft beer including fresh, local offerings from Massachusetts breweries like Riverwalk, Jack’s Abby, Navigation, Entitled, and Clown Shoes. Top-shelf wine and spirits are also available. And while you probably won’t be toting home cold leftovers from Dudley’s in plastic, smiley-faced takeout bags, you’re still going to have a good time and leave well fed. Behind the bar, New England craft beers on tap and creative cocktails. Hours: 4pm to 2am Mon-Fri; noon to 2am Sat; and 11:30am to 2am Sun. Terry Badman grew up in Vermont, where he developed a semi-unhealthy obsession with craft beer, pond hockey, and Cheddar cheese. A graduate of Castleton University, he has worked for newspapers and magazines in the Green Mountain State, and publishing and software companies in and around the Boston area. He enjoys cooking too much food for himself, pestering his two cats, and playing guitar poorly. Now happily residing in Lowell, Terry can usually be found prowling the local restaurants, pubs, and UML hockey games, seeking out good people and great stories.